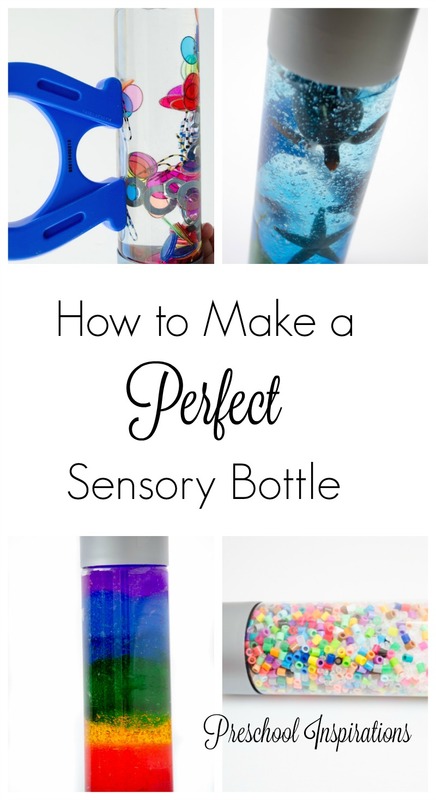 Make a perfect sensory bottle with these tips and tricks from a sensory bottle addict! I think it’s safe to say that I’m a slight sensory bottle addict. Since we’ve made so many around here, I wanted to share my best tips and tricks about how to make a sensory bottle — the sensory bottle you’ve been wishing for and dreaming of. A perfect sensory bottle is what you want it to be, but sometimes that takes lots of trial and error. We’ve had lids break, mold grow, magnets turn to rust, complete flops, and so many more unexpected results. They’ve always been an adventure though, and my approach has become much more scientific throughout the years. Hopefully, this will help guide you to choose the perfect materials and ingredients to make the sensory bottle you really want! They are wonderful tools to use at home or in the car, and in the classroom. Plus, they are a great addition to a preschool curriculum. The bottle is like your lens. The shape and clarity are important as well as the size and sturdiness. Through time I’ve learned that smaller bottles are best for heavy sensory bottles and a bottle that works well for big kids isn’t always what is best for babies and toddlers. VOSS water bottles are beautiful and sleek! The silver lid just gives it the perfect finishing touch. My rainbow discovery bottle is made from a VOSS water bottle. Oh and the water is super yummy too! I have found VOSS bottles at these locations: Kroger or King Soopers, Wal-Mart (online and in store), Whole Foods, TJ Maxx, a few convenience stores, boxed.com, Target, and of course online at Amazon . They come either as glass or plastic. I’ve always bought plastic because once I add a liquid ingredient, a bottle starts to get heavy. The plastic bottles are going to be lighter for children to pick up. Glass works well for some people though. This Voss Water, 11.2 oz. is the smalles size and perfect for all ages. I highly recommended it for any sensory bottles that use liquid. Sparkling ICE bottles are nice and smooth and a great option for a sensory bottle. My alphabet discovery bottle is made from one. Craft bottles come in many shapes and sizes and are a fun option for a sensory bottle. Craft bottles can be found at craft stores. I’ve seen them near the colored sand, and they are about $1 per bottle. If you are looking for them online, look for sand art bottles. 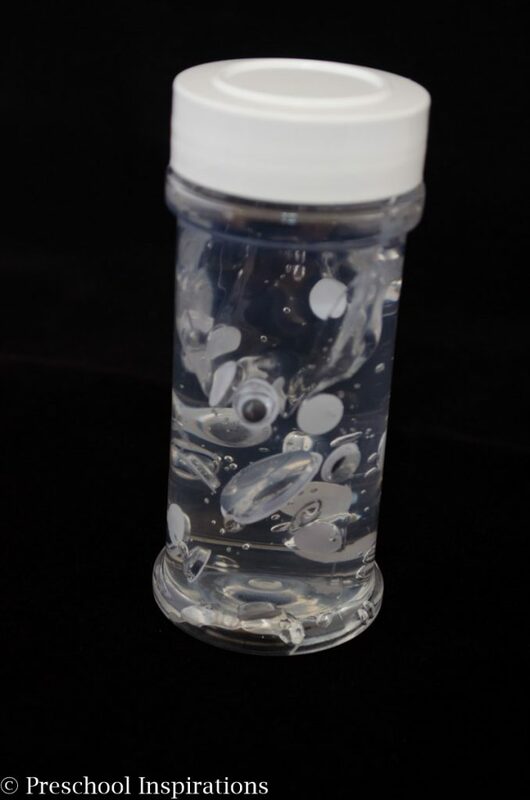 An Aquaball water bottle is a perfect alternative to a craft bottle if you are having trouble finding one. It can be easily spotted with it’s blue lid, and it is ball-shaped. I found my Aquaball at my local grocery store. 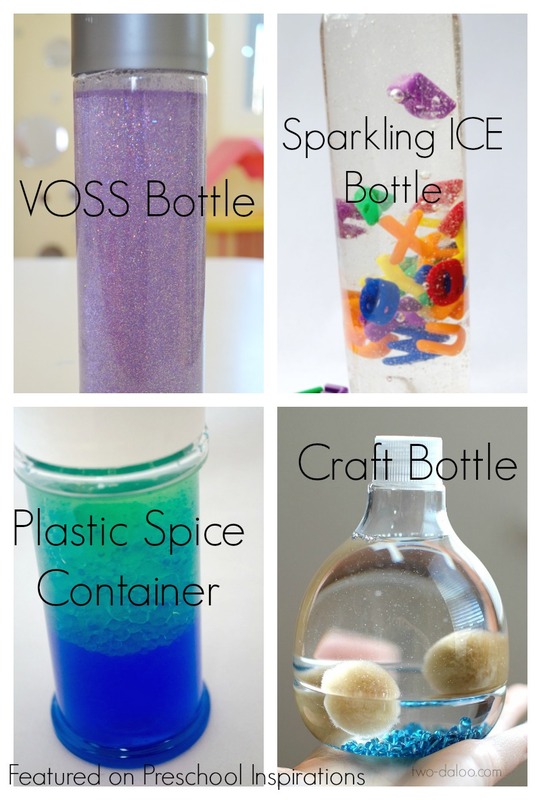 Recycled containers also make wonderful sensory bottles! Sugar Aunts has many wonderful recycled sensory bottles. Here is her math dominoes one. These are some sensory bottles made by my friend Cathy, and she used plastic spice containers that we found at the thrift store. Most recycled containers have a wide opening for objects to go through. You are adding new life to something old. Each container is different, so it’s hard to say. Other containers that are perfect for this are ones that once contained food. Peanut butter jars or similar work really well. Use a clean bottle when making your discovery bottle…otherwise, you may acquire some unwanted growth later on. I pour the water into a different cup, then rinse it out if it is a flavored water. To remove the label and the sticky residue, you can use Goo Gone or even peanut butter. I’ve had my Goo Gone for at least five years, so a little goes a long way! To color your bottle, I highly recommend liquid watercolor. You could use food coloring as well. I love using liquid ingredients! These are all of the ones that I have used and what they are perfect for. Keep in mind that anything metallic or magnetic will rust if you don’t put it in the proper liquid. Water – Almost anything! Just don’t add magnets or anything metallic to this one or else it will rust. 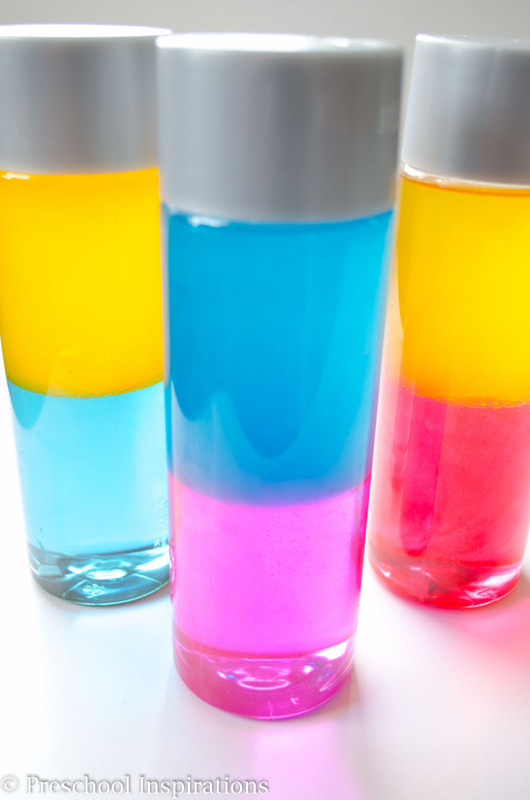 Colored Water – Just add some liquid watercolor or food coloring. Mineral Oil – This will slightly slow down whatever you have in your bottle. Items such as glitter will slow down a bit more. Mineral oil is also my “go to” solution for magnets and metallic items. Here’s my magnetic discovery bottle in mineral oil. Baby Oil – This is mostly scented mineral oil. It is available at the dollar store usually. I want to try the oil gel soon! Oil Dye – You’ll want to use this to color oil. Food coloring and liquid watercolor will not work since they are water-based. My color mixing sensory bottles are made of this! Cooking Oil – I love combining this with colored water! Liquid Soap – A nice slowing component. I use SoftSoap. Here is a calm down jar with liquid soap. Shampoo – This also slows the flow of objects. Glycerine – Glycerine will slow down things such as glitter slightly. Here is a calm down jar I made out of glycerin. Corn Syrup – Corn syrup will slow objects down quite a bit. Make sure your objects are super clean! My alphabet discovery bottle is made of corn syrup. Elmer’s Glitter Glue – A little goes a long way! I advise that you only use this if you are very experienced with making sensory bottles because it can be a tricky glue to work with. Here’s a calm down jar with glitter glue. 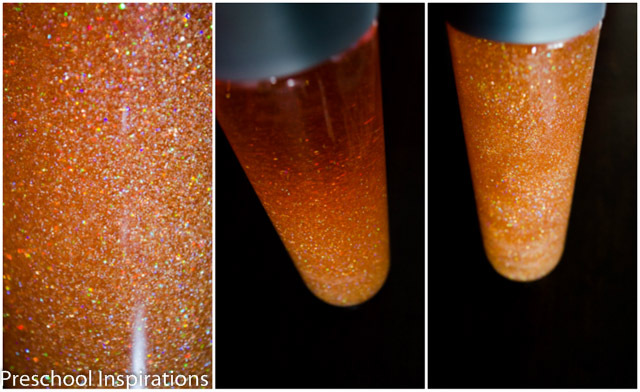 Glitter Glue – Mix this with hot water for a beautiful bottle. I use the kind from the Dollar Store. 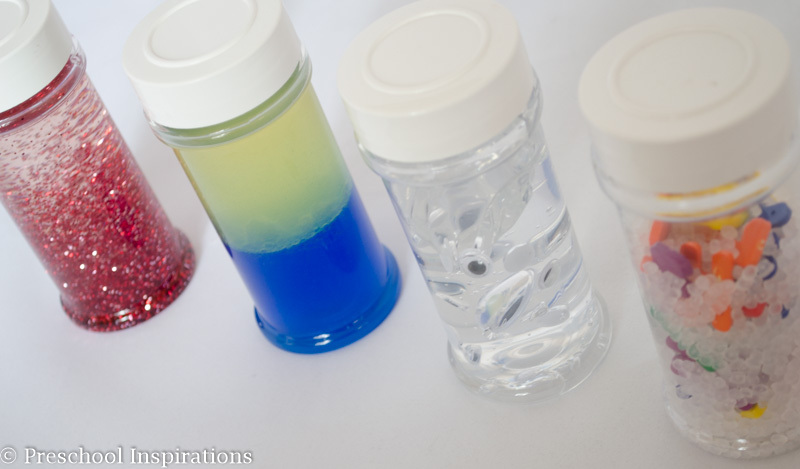 Water Beads and Water — One of my absolute favorite sensory bottles is made of water beads! 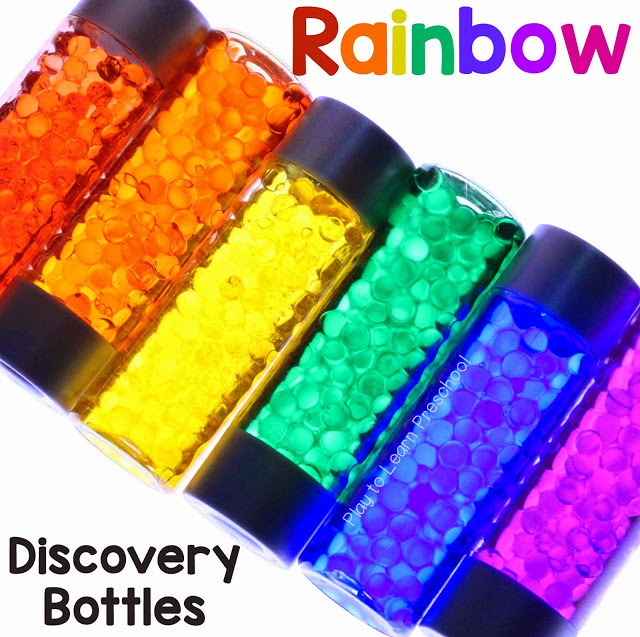 These Rainbow Discovery Bottles from Play to Learn Preschool are AMAZING. If you only make one set this year, make these! Tonic Water – Make something glow in the dark! Here’s one from Fun at Home with Kids, and she tells you the exact one to make it look clear in light. Dish Soap – Use a squirt of this if you have glitter that won’t sink. Magnets – See my Magnetic Discovery Bottles. Fine Glitter – I use this for all my Calm Down Jars. 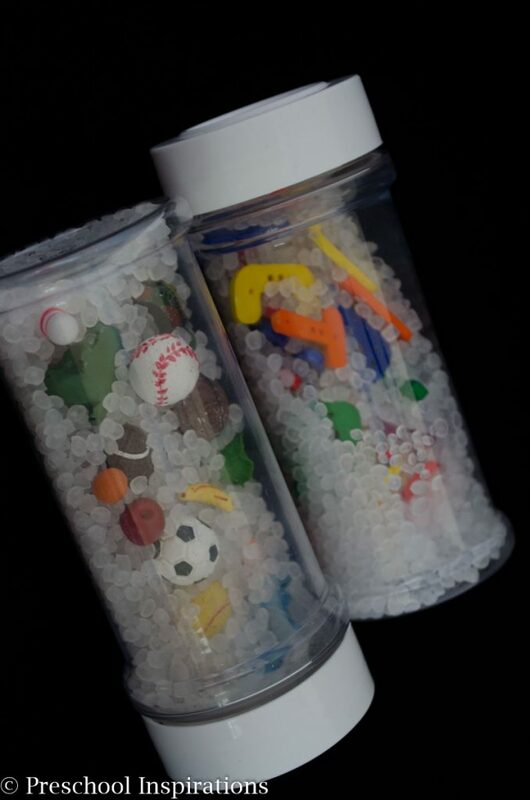 Poly-Pellets Weighted Stuffing Beads – These were a big component to my Musical Discovery Bottle. Confetti — My two favorites are this Frozen-Inspired Snowstorm Sensory Bottle by Rhythms of Play and this Heart Glitter Jar from Fun-a-Day. 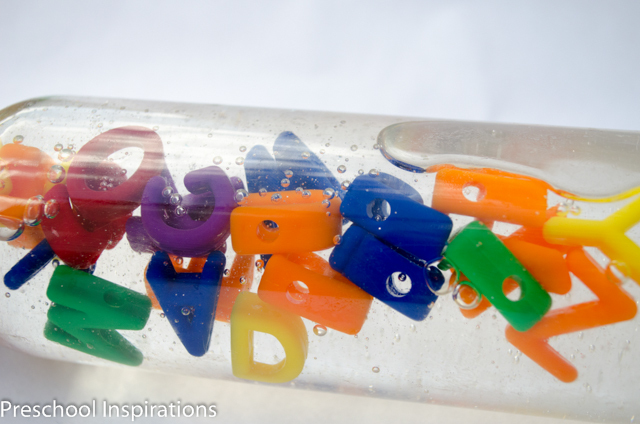 Alphabet Beads – There are so many types to choose from! Here’s my Rainbow Alphabet Discovery Bottle. TOOB Animal Sets – These are awesome, especially in some hair gel. Plus there are so many varieties of animals to choose from. 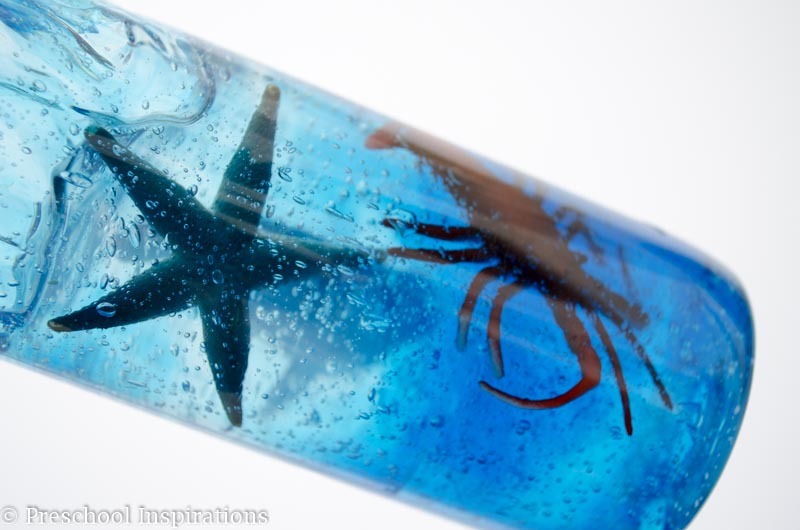 I used them for my Ocean Creature Discovery Bottle. Googly Eyes — Here are some in hair gel! Nature — I love these ideas from Lemon Lime Adventures. Mini Erasers – The dollar spot at Target is a gold mine for these. Legos – You may have seen this awesome Lego Calm Down Jar. Perler Beads — I love how Teaching Mama used them in her Slow-Falling Beads Sensory Bottle. Pony Beads – Fun at Home with Kids has an amazing pony bead discovery bottle. 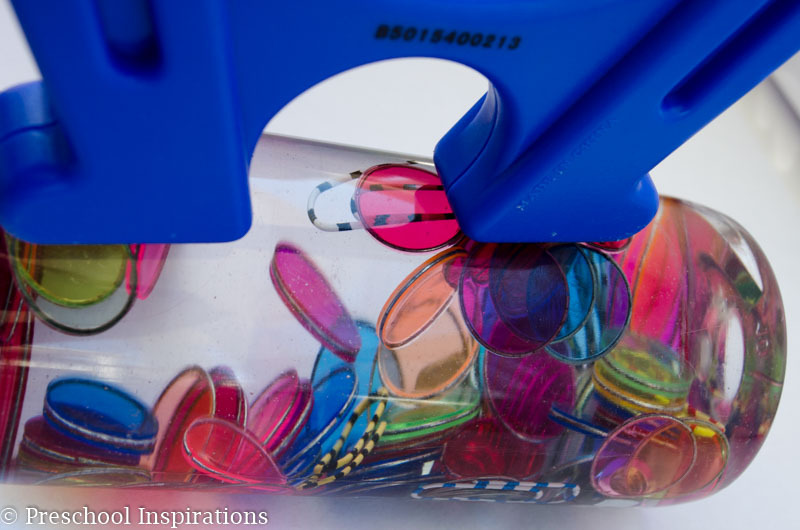 Pipe Cleaners or Chenille stems – These are magnetic so you can put a magnet on the side of the bottle to attract them. Beads – Nearly any bead looks great! Check out this idea from Stay at Home Educator. 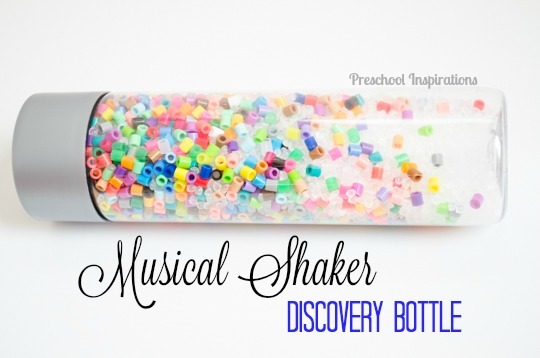 Marbles — This Inside Out Emotions Discovery bottle from Lalymom uses marbles in a brilliant way! Shredded paper – Here is ours that we made into a candy corn pattern. Scented items – I love scented sensory bottles. Check out these ones from Things to Share and Remember. Split Peas — Here’s a great example from Sugar Aunts. Dry Candy – I love this conversation heart bottle from Sunny Day Family and this fall pumpkin one from Modern Preschool. Once you’ve combined all of the ingredients together to make a perfect sensory bottle, it’s time to use the glue! I use a glue gun or Gorilla Super Glue . Keep in mind that you will need to glue your bottle every few months as the glue will wear off. Sensory bottles can last years, so I never feel bad about indulging with them! I’d love to hear what your favorite sensory or discovery bottle is! My new favorite bottles are Core water bottles. The caps make the bottle look cool and the bottle is a great shape for little hands to hold onto. https://taldepot.com/core-water-organics/ I buy them at CVS or 7-Eleven. Those sound awesome! I’ll be keeping an eye out for them! Grrr.what did I do wrong? I used hot water and hair gel with glitter glue as well. We dropped in glow in the dark stars too. But the stars don’t even glow!!! Hi Kathy! 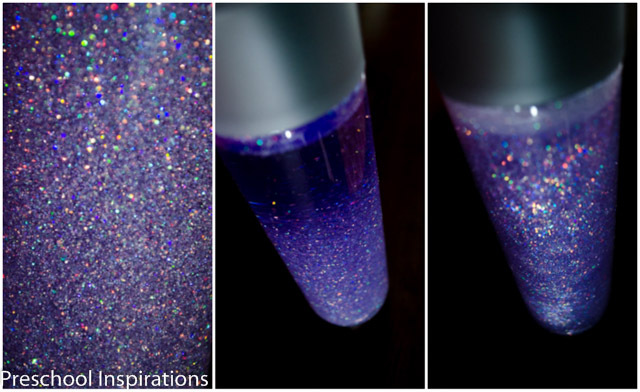 I’ve actually never made a glow in the dark star bottle, but I’ve seen them and they look awesome! Some glow in the dark products need sunlight for a few hours before they will begin to glow. I would put it in a window, then see how it works. Best of luck! It is possible to purchase empty Voss Bottles from Amazon now. I think the opening on them allows for a bet larger objects to go into the bottle. With most of the others, you must use smaller items. Love it thanks! But I’m not sure how to seal the plastic VOSS bottle. Do you think PVA glue will hold as a hot glue gun mightl melt it? I use super glue as well, and I think PVA glue would work too :). I see the links for the calm-down jars. Is there an auditory version of that for blind or sight-impaired children, or those ,like myself, who sometimes love to indulge in kid’s stuff? If so, please let me know! BTW, pintrest isn’t accessible with my screen reader, unfortunately, or I’d use it to find out. Great question! I do have one that sounds like a rainstick. It is so soothing. You can read about it here. This is an amazing idea (or bunch of them!) Thank you! Thanks again for a wonderful idea! What a wonderful idea for your daughter’s birthday party! I get the plastic bottles, and the sticker comes off. I also get some goo gone to help with any residue. I think it is a fantastic party favor :). Great question! Every ingredient is so different. If I use mineral oil, it’s completely mineral oil, unless I am making a color changing sensory bottle. But with glue I don’t need much glue. Just start with a squeeze and see if it’s enough. For each of my discovery bottles I talk about my proportions so if you see one you want to duplicate, it should give you the proper guidance. Have fun! I work at a daycare and my boss suggested to me that we should make some sensory bottles for my room. I’ve never made one and to be honest I haven’t heard much about a sensory bottle until she told me about them and asked me to Google them and see what I thought about them. When you use baby oil can you put anything in it? 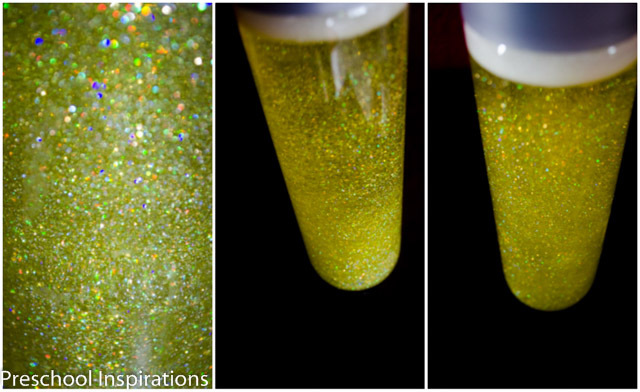 I think for my kids glitter would be a real eye catcher but I wasn’t sure how well the glitter would move in the oil. Some of the kids in my room also like to throw so I was thinking that in a worst case situation, the oil would be the easiest to clean up if a lid popped off! You have a wise Director :). Oil can be a mess to clean up unfortunately. Here are some of the easiest sensory bottles by my friend Jamie at Play to Learn Preschool that I recommend for beginners! Oh no! That’s such a bummer! Sometimes I’ve run toys through the dishwasher and they still did that too. I wish I knew exactly how to fix it. I’m going to do these with my middle schoolers. I think these are fun and they would have a ball making them. After all, they had so much fun making slime and stress dough. I think middle schoolers would definitely love this! I wish I was in your class when I was that age! Just stepping my foot in sensory bottles. How do you decide what liquid to use? I think it depends on how easy you want it to be, what your budget is, how much you want objects to flow or not move, and how sturdy the bottle is. Now that I have tile floors, I am much more careful with sensory bottles and prefer ones made with water. But when I had softer floors, I experimented a lot more. Hope that helps! 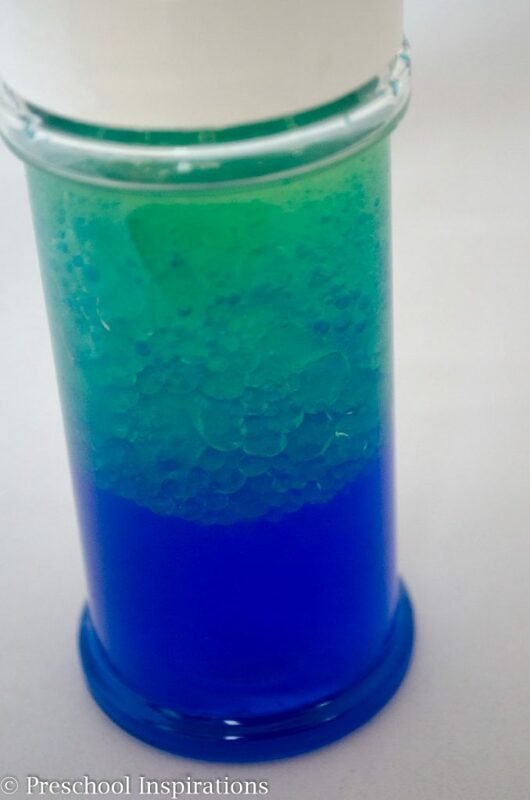 Have you ever try to make a sensory bottle with salt crystals? I want to make sensory bottles for each season and I think Epsom salt crystals can look like winter ice needles. I was wandering if they can be my “dry” ingredient. Also, what liquid filler I should use? Obviously I can’t use water or they will dissolve. Oil should work fine, but if I want something thicker , can I use hair gel, clear glue or glycerin? Any other ideas or tips? Salt crystal sound wonderful! I would probably just keep them dry personally :). Your sensory bottle sounds absolutely beautiful! Grandparents are angels!! I can’t wait to try one similar to yours.